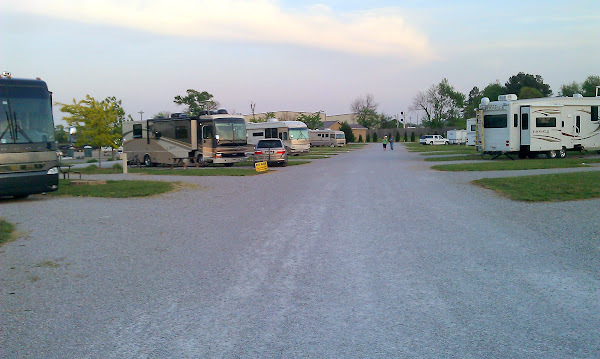 On Friday, April 13th, we checked out of Nashville Country RV Park and headed to our next destination, Cave Country RV Park in Cave City, Kentucky, a distance of about 90 miles. Traveling on Interstate 65, our drive was fairly easy except for several miles of construction as we neared Cave City. The last 10 miles or so made for unpleasant driving – the highway was down to two uneven and narrow lanes with jersey barriers on both sides. Signs advised trucks to use the left hand lane since there was a bit more clearance than the right hand lane. We finally exited at Exit 53, taking a right onto Route 90 East. From there it was just a short distance to a left on Sanders St. and then a right on Gaunce Drive where the park is located. 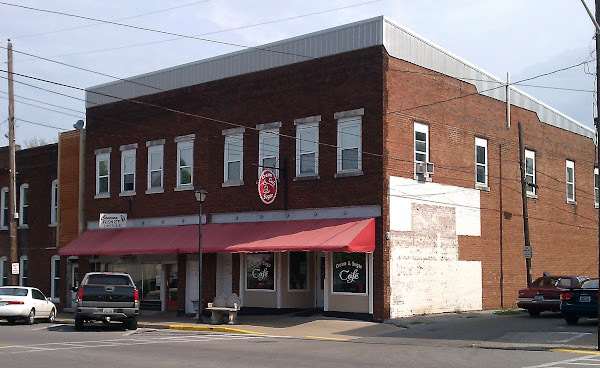 Cave City is a small town (population of 1900 in 2000) with the usual assortment of fast food joints, McDonalds, Subway, KFC and a few others along with an variety of hotel chains (Comfort Inn, Days Inn, EconoLodge, Best Western and a few others). It appears that their primary industry is tourism as there are a number of attractions in the area besides Mammoth Cave National Park. For example, Guntown Mountain and Dinosaur World are just the other side of I-65 along with a plethora of souvenir and rock shops and similar businesses. 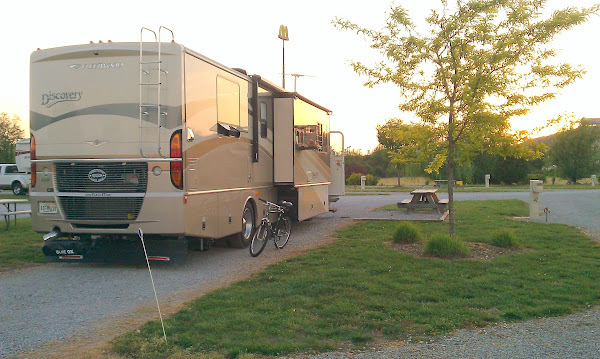 Cave Country RV Resort has about 60 sites, mostly pull throughs with easy access so they are big rig friendly here. All of the sites are gravel surrounded by grass with a picnic table and some have a fire pit (every other site). In addition to the full hookups, they offer free wireless and cable, a small store, bath/shower facilities, laundry and a clubhouse (which was locked). The campground was not full when we were here and the staff did a good job of staggering the rigs – we did not have anyone directly next to us on either side, the entire week we were here. In regard to facilities, power was excellent and stable at 125v on both legs of the 50A (the power poles look relatively new as does most of this facility). Water pressure was good, the water was clean and the sewer hookup (threaded cap) well placed for a motorhome. OTA TV reception was poor with only one of the major networks barely watchable, however the basic free cable made up for that – note though the “cable” here is a private re-transmission of Direct TV service and the channels do not map to any known service, so if you have a TiVo (or even a sat receiver with DVR and OTA capabilities) you can’t map your channels to a program guide. Verizon 3G and Sprint 3G were both very good, but the on-site WiFi was even better – actually it was great with about 5mb download/3mb upload rates, but then again there weren’t many people here at the time. 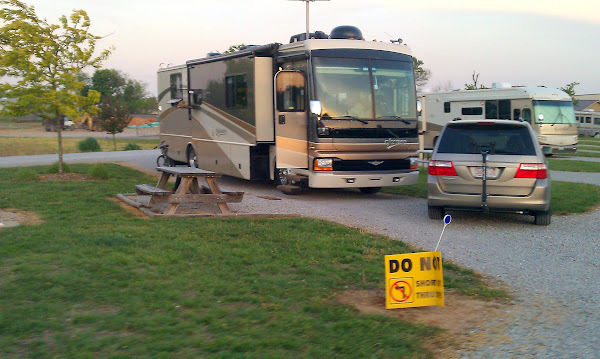 This RV park is very close to I-65 so is a great place to overnight. On the other hand there is a bit of road noise from I-65 as well as the adjacent state highway – the trucks heading westbound on SR90 jake brake down the hill blanketing the campground with a BAH-BUH-BUH-BUH-BA-BUH concerto. Also, the opposite end of the campground borders some very active railroad tracks. It seems like there is a train every 45 minutes or so, although that could be our imagination, and these are long (50-100 car), clunky (clickety-clackety-clack), whistle blowing (wooooo-wooooo-woo-wooooo), freight trains. In all the reviews we read (which were mostly favorable), no one mentioned the railroad tracks. On our first night here, we both were awakened around 1:00 a.m. and again around 3:30 a.m. by passing trains. On Sunday, we went to Mammoth Cave for the day. After we returned, between 4:00 p.m. and 9:00 p.m. there must have been at least six trains that blessed us with their presence. And these weren’t short trains either – each had about 100 cars so it took 3 to 4 minutes from them to be gone! That is the only real negative for this campground. Oh, and sometimes a “fresh fertilizer” like smell wafts from the adjacent farm land (we assume anyway – it has a nose like raw sewage with delicate notes of fresh farm animal scents topped off with a hint of hay), but that wasn’t too bad most of the time. Otherwise it is neat and well kept, and in our week here we observed the staff busily doing maintenance and improvement chores. It’s not a COE park by any means in regard to atmosphere (did we mention the noise? ), but it is what it is and for what it is, it’s a fine place to stop for a few nights. Would we come back here? Yes, but probably only for a night or two if we were passing through the area. On Saturday, we decided to take a ride to check out some of the other nearby campgrounds. 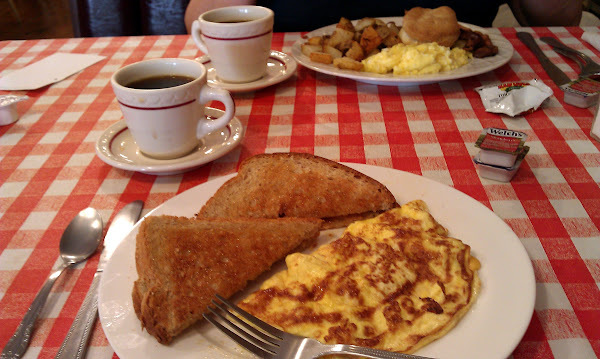 But first, at the recommendation of Jeff who checked us into Cave Country, we went to Cream & Sugar Cafe, a local restaurant that serves breakfast and lunch. Cute place! 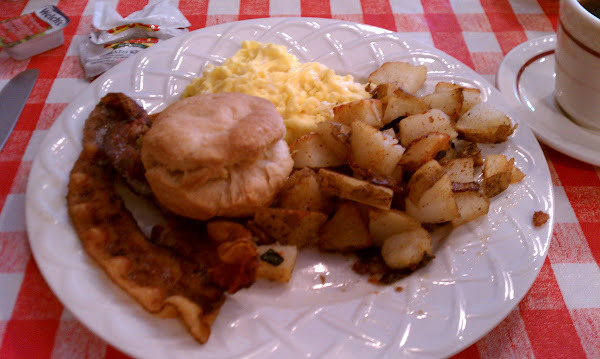 Rob had a bacon & cheese omelet and I had two scrambled eggs, home fries, bacon and a biscuit. Really good food! After breakfast, since it was a nice day for a ride through the very pretty Kentucky countryside (neither of us had ever been to KY before), we set off to check out Barren River State Park, thinking that perhaps we could move over there. 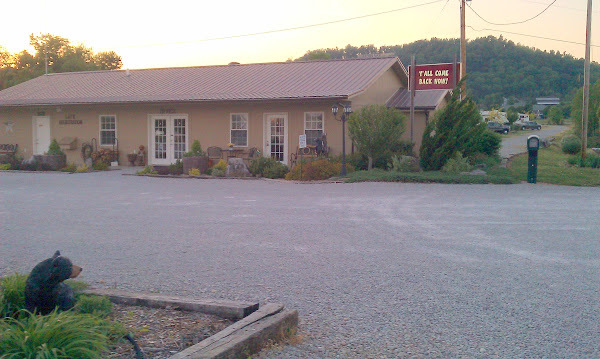 Barren River not only has a campground but also has an inn, cabins and a restaurant so it sounded pretty nice. However, we weren’t impressed with the campground – very hilly sites and no other redeeming qualities that would justify us going through the bother of moving. We also checked out the Yogi Bear Jellystone Campground, which is just West of I-65 on SR70 (Mammoth Cave Road). It seemed OK, but it was sited in a hilly area so many of the sites also appeared unlevel and it was clearly more of a family oriented (kids) place. The cost is similar to Cave Country, but the clickety-clack of the trains should not be as loud. 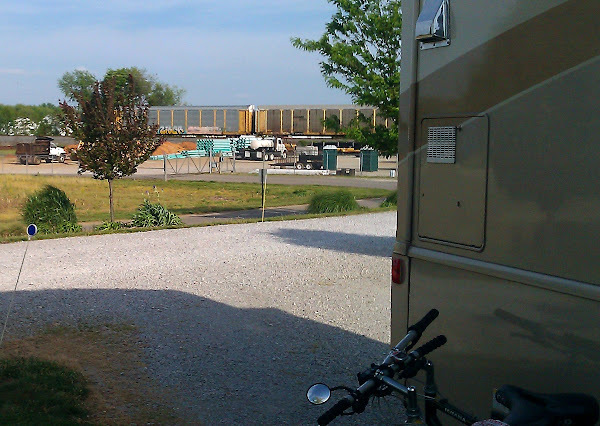 A little further up Mammoth Cave Road is Singing Hills RV Park & Campground. We did not get a chance to go in there but it gets favorable reviews and is a Passport America participant ($16/night). I think for another multi-day visit to Mammoth Cave National Park we might consider staying here to avoid the train noise. In addition, Mammoth Cave National Park has three campgrounds. 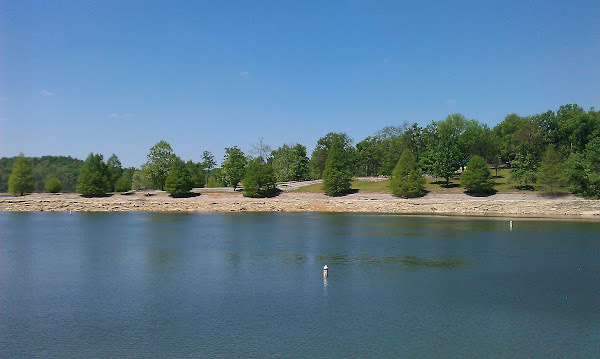 Mammoth Cave (105 sites with no hookups), Houchin Ferry Campground (12 sites not suitable for big rigs) and Maple Springs Group Campground (no hookups, 3 group sites for up to 24 people and 4 equestrian sites). Mammoth Cave campground was pleasant and wooded and of course just an easy walk away from the National Park visitor center. The bike path (gravel) also intersected this area. The sites varied widely in size but there were places here (mostly the pull-thru’s) for big rigs. This might be an option for us in the future if we if we are in the mood to “dry camp” for a few nights. 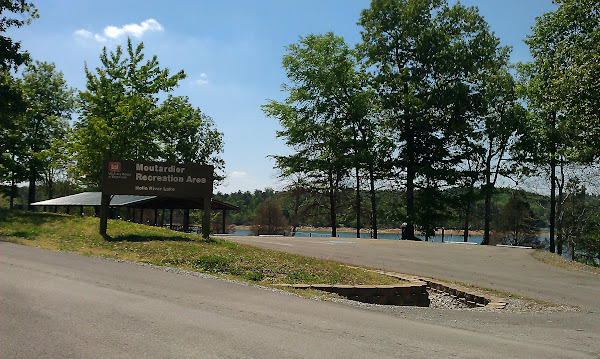 Later in the week (4/18) we took a ride up to Moutardier Recreation Area to get a look at the COE (Army Corp of Engineers) campground there which is north and west of Mammoth Cave Nat’l Park. It turned out it was closed, but reopening for the 2012 season the next day (Fri 4/19). We could see some of the sites and it looked nice! T he picture to the right is part of the campground as viewed from the boat ramp area. This is a typical COE park (that’s good) with what appeared to be pleasant, well spaced, moderately treed sites. 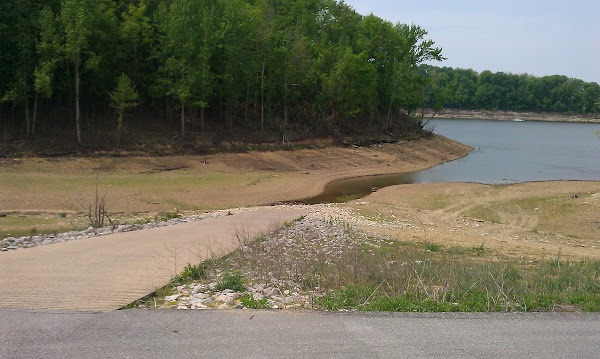 Not all the sites here can handle big rigs, but most probably have a view of the Nolin River Lake. There are no sewer hookups here. 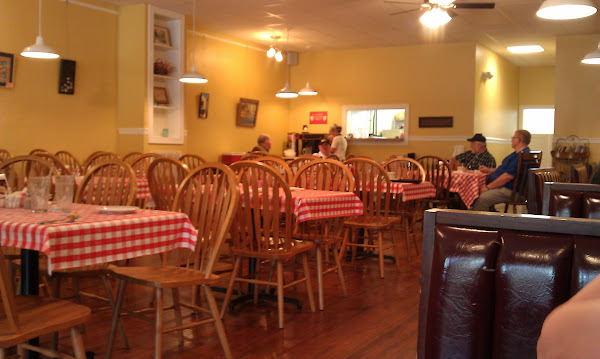 One consideration if deciding to visit Moutardier is its distance from the interstate – about 50 minutes worth of driving on secondary roads. The roads are in good shape and have a small shoulder except for the last few miles where the shoulder is nonexistent and the road becomes a bit twisty. Not a place you would go for an overnight, but probably well worth the trip if you are going to stay for a few days. If you do go, use SR 70 and SR259 toward Bee Spring – do not go via the Green River Ferry (on Ranger Station Rd inside Mammoth Cave Nat’l Park) as I doubt it can handle big rigs! Nice explanation of truck and train sounds too.. sounds like my neighborhood. Did you get to see the GM Corvette factory in Bowling Green? They do tours too but on a very limited schedule.